Last year, for our family summer vacation, we travelled from Southwestern Ontario to the Eastern seaboard of the United States. Because we have small children, we broke up the 10 hour drive over two days and opted to stay at a chain hotel that was perched at the exit of a turnpike. The hotel was surrounded by gas stations and fast food restaurants. Our stay was unremarkable except for breakfast - which was free with our stay at the hotel. The free food itself was unremarkable. It was a serve-yourself buffet of single serving boxes of dry cereal, packages of quick oatmeal, toast, scrambled eggs, bacon, pancakes, donuts and pastries, milk, juice and serviceable coffee. What struck me is that it only took a single person to staff the large breakfast room. That's because all the containers and cutlery were disposable and the 'fresh food' was pre-mixed and cooked in either in the microwave or in the custom ovens, like the one for eggs that I spied in the back 'kitchen'. I remember trying to figure out what it meant to live in a world where the best paid jobs in a business are dedicated to those who ensure that the are as few poorly paid jobs as possible. I'm writing this about a year later. We've made the same trip but we've altered our route. We also decided not to stay in a chain hotel this time and picked a quaint family owned hotel in Pennsylvania, right in the hear of Amish Country. In spite of this, it too offered the same buffet of free, disposable, single serving breakfast. Is this what we mean by post-scarcity? It's difficult to argue with most people about the free market. One reason why it's difficult is because proponents of capitalism don't see much the point of arguing. To them, trying to make a case to curb the insatiable need for profit over labour is not unlike trying to argue against gravity. And yet isn't being unemployed not unlike to lose one's gravity that moors you to society at large? When it is cool enough to have the windows open, we can hear churchbells if the wind cooperates. I hear them now at the top of the hour, sad low bells that mark another hour passed. But there are no churchbells. There is only a recording of churchbells. I've walked past the nearby church and noticed that openings of the church steeple are covered with white-painted speakers. 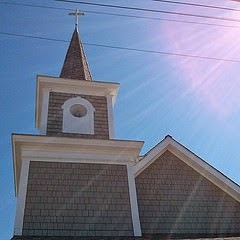 Am I really suggesting that someone should be employed to ring the church bells on the hour? Yes. Well, no. To be honest, I'm not sure where to draw the line. A printed newspaper gives you yesterday's news in order to make better sense of today. What's not as well recognized is that you can read the same paper like tea leaves to see what you can make out of the shape of the future. Today's paper had a couple of letters to the editor in response to a story of an opera that is planned to be staged with a recording of an orchestra. The letters both ask, then why not replace the singer with a lip-syncher. Why stop there? Why not replace the artist with a hologram? Other than that first breakfast buffet, we haven't gone out for breakfast during our weeklong vacation. There's a pancake place nearby but the locals have warned us that too easy for a hungry family to rack up a bill over $100 there. In Southwestern Ontario, as well the parts of Michigan that I know, the most reliable place for a cheap but hearty breakfast, are Greek restaurants. The coffee is usually not that good, but for less than five dollars, you can get your fill of a couple of eggs, toast, and potatoes to get your day started. Unlike last year's roadtrip, this year we have eaten out so much better. Last year, we tried to find local diners to fuel our travels, but every one of those we tried offered pre-frozen and processed foods. But this year, we somehow lucked out. We found a small bar by a soccer field where we watched the world cup and wondered why our food was taking sooooo long but decided the wait was worth it once we realized that the food eventually presented was fresh and flavourful. Later in the week we had great pizza and yesterday we went to a lovely and loud family restaurant with short menu of delicious fare. In retrospect I realized that whenever we had eaten out, we had eaten in Italian restaurants. Every night this week I have been reading my kids 'Percy Jackson and the Lightning Bolt Thief'. It's like Harry Potter, but instead of Wizards, you have Greek gods, and instead of Hogwarts, you have 'Half-Blood Camp'. But the story doesn't take place in Greece. Olympus has moved to the new centre of Western Civilization: the United States, and more precisely, to New York City. I think about the future a great deal and I worry about it too. I keep wondering that if people have no place in businesses anymore, perhaps we need to build new institutions that are human-centred. Or if we can't sustain organizations anymore, perhaps we should encourage new forms of just-in-time arts events to ease the pain of what they've replaced. But sometimes I think that it might be more fruitful to look to the cultures that seem to resist change. And to resist the free breakfast buffets.